When Ken Richardson walks the streets of Haverhill MA kids on the street learn quickly that there's a new kind of crime fighter in town. Just like the comic book hero whose life changed with the violent loss of a loved one in childhood, Ken's younger brother was shot to death when they were both still teenagers. 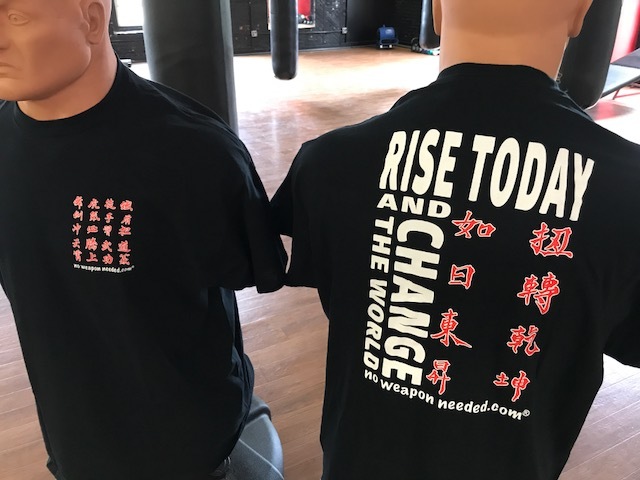 Unlike his comic book superhero counterparts, however, Ken doesn't attack the villains, he teaches children the skills and discipline they need to be safe on the streets, and avoid becoming the bad guys in the story. No Weapon Needed was started over thirty years ago in April of 1981 when my brother was shot by gang members. I had just started Basic Training, and the Army sent me and my older brother home. I realized that I had to do something to get the kids to put down their weapons. I was a poor kid, grew up on the streets of Baltimore, had an abusive father who beat my mother, my brothers, sister and me. I was always fascinated with martial arts. When I was really little, I used to try to learn by looking in the window of the martial arts school down the street, and by watching kung fu movies and TV shows like the Green Hornet. When I got older I used to shovel snow, cut grass, deliver newspapers to pay for my martial arts classes. So when my brother was murdered, I started talking to kids, teaching them and telling them they didn't need guns to take care of themselves. No Weapon Needed isn't a company, or a non-profit organization. It's a way of life for Ken Richardson, who estimates in over thirty years he has spent over $100,000 of his own money, paying for kid's gym fees, equipment, and even food when he finds out his students haven't gotten enough to eat. Since his acoustical contracting business went under a few years ago because of the recession, he has spent all of his time and money, promoting his non-violent message with the kids, trying to make sure what happened to his brother doesn't happen to them. Last Christmas was typical for Ken Richardson. He went back to Baltimore to visit his mother, and at night while everyone slept, he walked the tough streets, talking to kids about violence and handing out No Weapon Needed T-Shirts to them. Since 2005 I've given away over $5,000 worth of T-Shirts. The kids think I'm crazy, but it is Richardson's calling card, I can see the spikes on my website after I do something like this and I know they're curious enough to check me out. It's all part of getting the message out. Richardson, who has always trained while listening to rap music, has longed to put out a rap song and video of his own, one that spreads the anti-gun and anti-gang message. In 2010 he got his wish, when he found a rap artist Jeff Ofure Utubor who wasn't into rapping about the violent behavior so pervasive in the music. For years I walked some of the more violent neighborhoods in Baltimore and Massachusetts, talking to the kids and asking them if they knew a rapper who could do the song, but all the musicians were so violent. Finally in 2010 my daughter came home one night and told me she had met someone who might be able to do it. So I met with him, and after talking with him I realized that he was the guy. God had finally brought him to me. Richardson personally funded the No Weapon Needed song and video and started playing it at the gym, and it has made a huge difference. The No Weapon Needed song and video has been an incredible experience for me. It's the first time I've ever done anything like this. I don't know anything about making music. I know martial arts. I listen to rap music all the time. I know what I love to hear. This is so, so powerful for these kids. Music is the great communicator. It always will be! It has done so much for these kids and it has pushed our message so much further. There's a little kid down at the gym. He's court ordered to go there after school. He's thirteen years old and hated me. He hated me because I always made him work out. I'd tell him to clean up his mess in the gym. I was kind of like a drill sergeant towards him. I wanted to bring him away from the violence and trouble of the streets, take him under my wing. But he constantly rebelled. He hated me, his sister hated me, and his brother hated me. I never showed him the video, I kept it all secret. I invited him to the big video unveiling at the gym. When that kid saw the video, heard that music, I could not get him and the other kids away from me anymore. They are always following me around, constantly asking me for a No Weapon Needed shirt. Now they're constantly cleaning up after themselves, not just running around the gym going wild. They're doing what they're told to do. And his mother even said to one of the coaches that it has made an improvement in his home life. That's what I'm trying to get to with this message of the music. You know, the music is what talks to these kids. Along with the martial arts and the street awareness skills, if I can put out more music for these kids, I can talk more to them, do more for them. Richardson has recently become aware that he can't continue to do this alone. The personal toll has been high. I've suffered so much to do this, and have lost so much in my life. I've tried doing other things, but I can't imagine doing anything else. He gets help in unexpected places, like the owner of a local deli where Richardson eats and buys gift certificates to give to the kids at the gym he coaches out of. When the owner found out what he was doing with all the certificates, he refused to take more money, and said he was returning all of the cash Richardson had already spent. Richardson told him to give it to him in certificates, then went back to the gym the very next day and handed them out to the kids. He would love to be able to expand the program and make it more sustainable. But Richardson believes it's only a matter of time. No Weapon Needed is very unique. There is no other program out there like this. I have lived through the violence, the murders, the gang life, the intimidation. No Weapon Needed reflects my experiences and my knowledge of what these kids are going through on the streets today. We work to combine the music, the martial arts, the mentoring, the street and awareness skills, all in one program. The music always talks to the children. We put a twenty year old rapper on the screen in front of the kids and let the kids watch that. That's how we get our message across. Then little by little, working with them, they see that they want to be a part of it. They can see that this is a very cool thing, that the martial arts works, that the awareness works, that the other kids love it. I'm the only person doing this. That's why it's going to be a success. © 2017 - 2019 No Weapon Needed. All rights reserved.